People often ask why it is so expensive to live in Hawaii and certainly one of the reasons is that nearly everything we consume must be shipped in either by surface or by air, but that is not the only reason why everything is so expensive. One cost that people rarely consider is the cost of the general excise tax as it affects the cost of living. For example, because the general excise tax is imposed on all transactions, the cost of the tax exacerbates the cost of goods and services purchased by consumers. True, where goods and services are purchased for resale, the tax rate is the lesser 0.5%, but that is not the case where goods and services are purchased and consumed by businesses. For example, the rental of a warehouse or retail shop is subject to the general excise tax at the full retail rate of 4%. Since the cost of renting the warehouse or shop has to be recovered if one is to stay in business, the rental cost plus the cost of the tax must be recovered in the price charged for the goods or services sold from the warehouse. And because the general excise tax is 4% of the cost of the rent, as rent increases occur, so does the absolute dollar amount of the tax. Another area where the general excise tax exacerbates the cost of living in Hawaii is energy. While every effort is being made to wean Hawaii from its dependence on fossil fuel, it will years before all of Hawaii’s electricity will be generated from alternative sources. Until then, our electricity will be generated from the burning of crude. Although one might think that burning energy in the form of crude to transform that energy into electricity would make the purchases of crude a sale for resale, the tax department uses the rule governing the purchase for use in the manufacture of products which requires the initial purchase to be perceptible to the senses. Since the tax department argues that the crude is not perceptible to the senses of the end user – the electricity customer – the crude is actually being “consumed” by the electric company and, therefore, is subject to the full retail rate of 4%. Of course, as the cost of the crude soars, so does the cost of the tax on every barrel. If lawmakers want to do something about easing the cost of energy, they might want to consider recognizing the purchase of crude to generate electricity as a purchase for resale and tax that crude oil at 0.5% rather than 4%. In fact, one of the major differences between the general excise tax and the retail sales tax found on the mainland is that business-to-business transactions are either exempt or taxed at a substantially reduced rate under a retail sales tax. As all consumers have learned, the rising cost of energy has affected prices at the store as well as the cost of keeping the lights on in our homes. Finally, there is the cost of complying with the tax that will be made more expensive when the 0.5% surcharge kicks in on January 1. Accounting for the tax will get more difficult as businesses try and figure out whether they owe 4% or 4.5%. Even Neighbor Island businesses will have to contend with the added cost of the 0.5% surcharge if the tax department’s current interpretation stands. Having realized that the state’s use tax law only applies to purchases made from unlicensed sellers, that is, a business that does not have a general excise tax license, the use tax cannot be imposed if an Oahu consumer buys something from a Neighbor Island seller as that seller is already licensed under the general excise tax law. As a result, Neighbor Island businesses will have to determine where their customer is going to consume the goods or services sold. If the consumption takes place on Oahu, it will be subject to the 0.5% surcharge. Or if some of the services or goods are to be consumed on Oahu and some on a Neighbor Island where the surcharge does not apply, the seller will have to determine what portion of the gross income received for the goods or services is allocable to Oahu and subject to the 0.5% surcharge and how much is used on the Neighbor Island. Making these determinations will just add to the cost of accounting for the tax, a cost that will have to be recovered in the cost of the good or services sold. Embedded in the cost of overhead, the general excise tax certainly adds to the cost of living in Hawaii, yet because of its low rate the tax is never the suspect to the uninformed eye. It is insidious, creeping into everything that is consumed and produced in Hawaii. So it not only imposes a heavier burden on our pocketbooks, it also puts everything made in Hawaii at a competitive disadvantage on the world marketplace. Yes, lawmakers can do something about the cost of living in Hawaii by addressing the insidious general excise tax, but only if they can curb their excessive spending of the revenues that the tax generates. The Feds Gave You a Break? 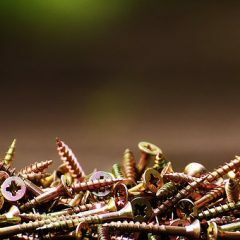 Now We, the State, Can Turn the Screws!